I had posted on Facebook yesterday that my dogs are getting used to this vegetarian way of life of mine. I take great pride in the fact that I see them drool when I’m making seitan, because in my head, I feel like I’m tricking the little carnivores into believing I’m still eating meat. To my surprise, I quickly had several friends ask for some of my recipes. It just so happened that I was experimenting with my seitan and looking to make a carnage-less carne asada. And what rocks is that the recipe was absolutely unbelievable, so as I sit here stuffed in vegan heaven, I thought I’d share what I did. 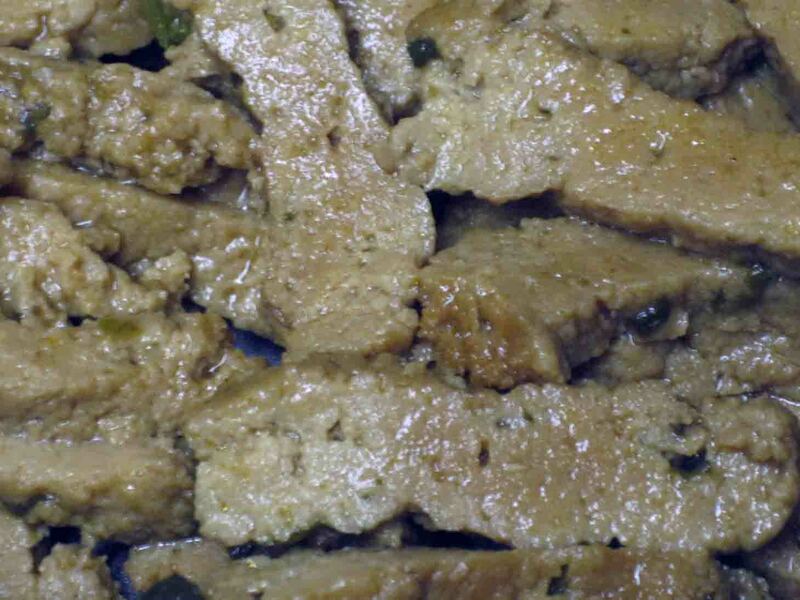 We begin with a homemade seitan. If seitan is something you’ve never experimented with before, I’m telling you, it’s pretty fun to play around with in the kitchen. It’s a high-protein meat substitute made from wheat gluten, but the best way I’ve found to describe it is that it’s actually sort of like a dumpling that takes on a beef-like consistency. 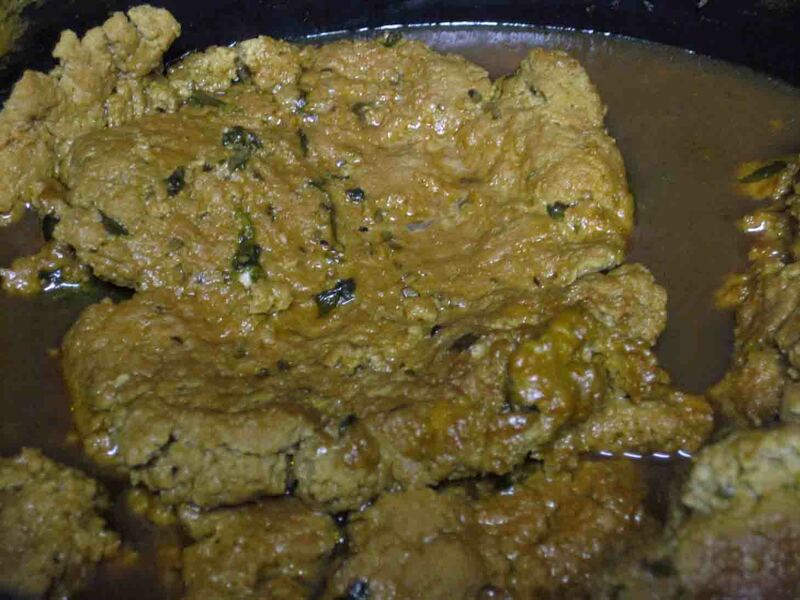 I’ve used seitan to make mushroom strogranoff, a seitan pot pie, a pseudo veal Parmesan, BBQ sandwiches, and every time, the seitan took on the flavor characteristics of whatever it is that’s being made. The seitan recipe I created last night was made specifically for this carne asada-inspired dish. In a bowl, mix together 2 cups of Vital Wheat Gluten Flour (found in the baking section of health food stores), 6 Tbsp. Nutritional Yeast (found in the supplement section of health food stores), 3-4 cloves of minced garlic, 1 tsp. chipotle, 1 tsp. cumin, freshly ground pepper, and about 1/4 to 1/2 cup of fresh cilantro. Add 3/4 cup vegetable broth, 1/4 cup soy sauce and 2 Tbsp. olive oil and mix until it’s dough-like. Knead the dough until it has a tough, elastic texture. From here, I start to flatten out the dough to the size of several beef or chicken cutlets. Drop the dough into 6 cups of boiling vegetable broth and let it cook at a simmer for about an hour. Once the seitan cooled a bit, I sliced it into strips, like so. 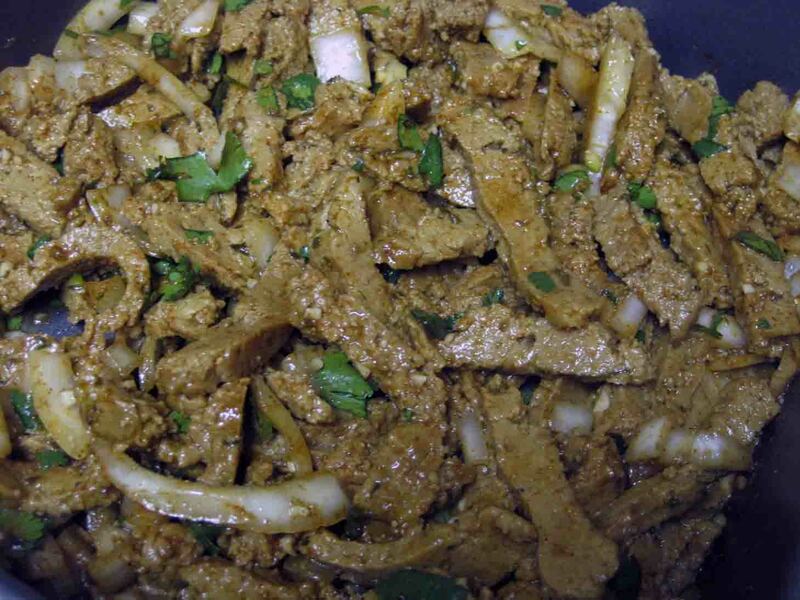 Keep in mind that the recipe makes a ton of seitan. I sliced about a third of the “meat” into strips, then stuck the rest in the fridge in the broth in which it cooked. You can use what’s left in any recipe that calls for meat. Since it has a bit of a southwestern flair, try it in enchiladas, fajitas, or even a spicy soup. Plus, I’d like to add that 4 ounces of ground beef has 280 calories and 28 grams of protein compared to 4 ounces of seitan, which has 114 calories, 20 grams of protein, and a fraction of the fat. In other words, eat up! Once the strips were ready, it was time to marinade them overnight. The marinade consists of the juice of a lime, 3 cloves of minced garlic, 1/3 of an onion (chopped), a handful of chopped cilantro, 1/2 tsp. cumin, 1/2 tsp. paprika, 1/2 tsp. oregano, 1/4 tsp. coriander, 1/4 tsp. cayenne pepper, freshly ground pepper and a big pinch of sea salt. Mix the marinade and toss the sliced seitan in a ziplock bag or bowl, cover it and stick it in the fridge overnight to let the flavors meld. The next day, add 1 Tbsp. olive oil to a wok or skillet. When hot, add the beef strips, and the veggies from the marinade, too, and cook until the edges are a bit crispy. 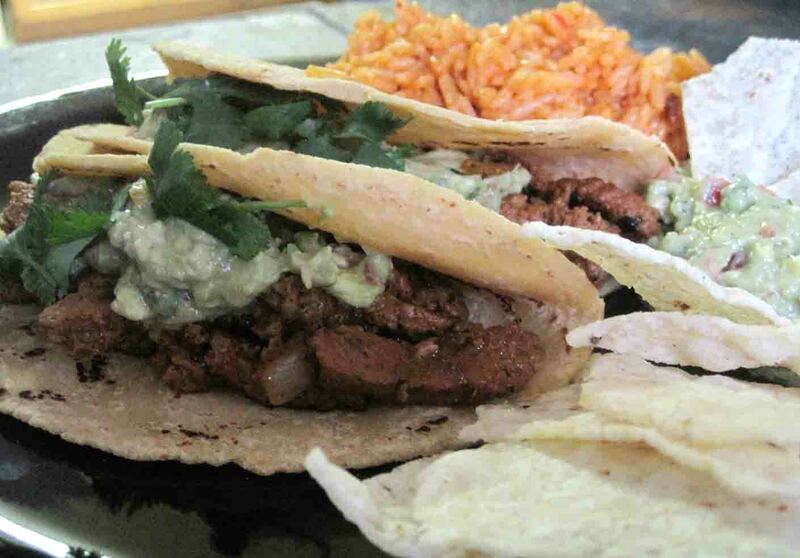 Serve the beef in corn tortillas (try to find a local brand, or something organic, because they taste so much more fresh and delicious than most brands you find in a grocery store) with your favorite taco fixings. They are awesome loaded up with heart-healthy guacamole and some fresh cilantro. They’d probably taste wonderful with fresh onion, tomatoes, and lime. Whatever makes you happy.